There are so many traditions and customs associated with this wonderful feast day. In our family, none of them was really favored more than any other so I decided to basically just pick a traditional food to go along with our house blessing. Since some of my husband's ancestors came from France, I am attempting to make a Galette des Rois which is an almond paste filled puffed pastry topped with a gold paper crown and containing a hidden feve or favor. I say attempting because I haven't made it yet but I started assembling the ingredients and making my homemade almond paste when I discovered that having never used almond paste before, I have no idea what "the right consistency" is. I will post pictures once it's done. It's done now and aside from a little oozing from a part that wasn't sealed properly, it baked up very nicely! Here is my galette along with our tiny little bits of gold, frankincense and myrrh. 1. Thaw frozen puff pastry according to package directions. 2. Place almond paste into a food processor or blender with about half of the sugar and process until well blended. Add the butter and remaining sugar and process until smooth. Blend in one egg, vanilla, almond ext., flour and salt. Set aside. 3. Preheat the overn to 425 degrees. Butter a baking sheet or line with parchment paper and set aside. 4. Roll out one sheet of puff pastry into an 11 inch square. Keep the pastry cool, do not knead or stretch. Use a large pie plate to trace an 11 inch circle on the dough using the tip of a sharp knife. Place the circle onto the baking sheet. Repeat with second sheet. 6. Beat the remaining egg with a fork and lightly brush the top of the galette. Use a knife to make a criss cross pattern in the egg wash and then prick several small slits in the top to vent steam while baking. 7. Bake for 15 minutes in the preheated oven. Do not open the oven until the time is up or the patry will not fully puff. Remove from oven and dust with powdered sugar. Return to oven for an additional 12-15 minutes or until top is a golden brown. transfer to a wire rack. 8. Serve warm or cold. Place a gold paper crown on top. Make sure to tell everyone about the bean or the coin. Oh, one last thing about the crown—you’re not supposed to keep it. If you win, you can pocket the trinket, but when you get the crown, you’re meant to place it on the head of your chosen king or queen. It’s a lovely tradition, but one I’ve never seen honored. 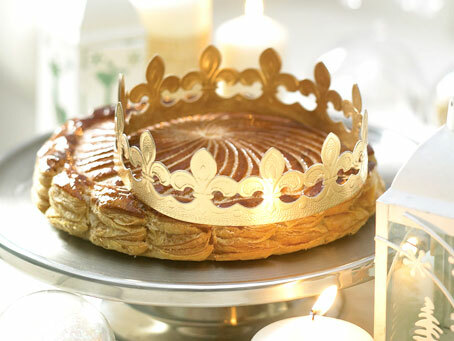 Everyone I know who’s won, has plunked the crown on his or her head, gloated over winning and dug into the galette. I think we will let whoever finds the feve have the privilege of crowning our Holy Infant statue. 1/8 cup or 2 T water is enough to make it the right almond paste consistency. PS If I could catch a flight to Texas and be there by dessert, I would! One more thing - my electric coffee grinder was the only thing I had that ground the almonds fine enough for "meal." Oh this is lovely. 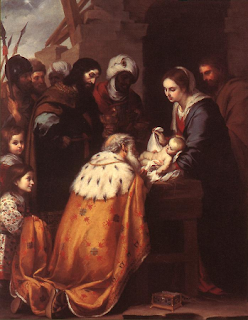 One of my favorite ideas for the Epiphany comes from working with some hispanic friends a few years back. It is a similar pastry and inside of it are tiny plastic babies. I believe it is Mexican in origin. The women I worked with used it as who ever got the babies would be responsible for the last treats on Marde Gras - before the start of Lent. Not sure that is the original meaning but I liked it. We had fun with it every year. I love almond flavoring, so this has to be good. Your presentation is very beautiful. We made it the day before to have it ready and it kept well. It was extra great because I actually had all of the ingredients. Well, except the almond extract and the dc chose orange extract instead from what I had on hand. I made it using the (wheat)yogurt dough from Nourishing Traditions so it wasn't as 'fluffy' as regular pastry dough but it was still light enough for this dish. Thanks so much for all of your recipes for Feast days. One of the best things about a recipe like this is that the results are so impressive, but it's so very easy to actually make -- we enjoyed our third one this year. (Of course, more artistic people like yourself will get the best results! I top mine with sugared sliced almonds, so the cutwork is less important.) :) As to the seal: I've since learned that a little egg wash "glue" on the bottom outside edge really helps. I loved your historical note at the end -- what a beautiful tradition. Those are so fancy & delicious looking! In Switzerland we had a simple raisin bread. I made on again this year, but we will eat it tonight because I had a migraine last night! I might have to try this yummier version, especially for my American husband and children who have "sweet teeth".